Market Area (Milk) : Wayand District, Tirur, Malappuram and Kottakkal areas of Malappuram district, Quilandy and Vadakara Taluks of Kozhikode district and Koothuparamba area of Kannur District. Market Area (Milk) : Kozhikode District, Kondotty,Manjeri , Nilambur and Areakode areas of Malappuram District. Market Area (Milk) : Palakkad District, Perinthalmanna, Kuttippuram and Ponnani areas of Malappuram District. Market Area (for Long Life Products) : Entire area of operation of MRCMPU Ltd. 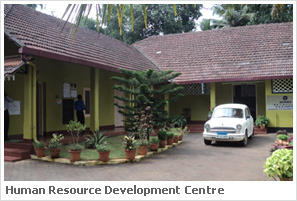 The Human Resource Development Centre was established in 2001, with the intention of imparting quality training to farmers, peoples’ representatives from the dairy cooperatives and staff of milk societies and milk Unions. We are also conducting training programmes for external agencies on special request. The present package of training programmes include Co-operative Leadership Training for Milk Society Presidents, Secretaries training on Final Accounts and Audit, Milk Testers’ training programme, Training programme for Milk Collectors and Helpers, Special training on Handling & Monitoring of Village level Bulk Milk Coolers (BMC) and Automatic Milk Collection Units (AMCU), Leadership training, Fodder & Farm Entrepreneurs training etc. The HRD Centre is also taking up special training modules for Village Resource Persons (VRP) & Union Personnel. Workshops for officers from Procurement & Input Dept., Personnel Dept., MIS & Systems Dept. & Marketing Dept. are also conducted at the Centre. The institution is located about 10 KMs away from Kozhikode Railway Station, close to the Beypore Port, which has tourist attractions like the Beach and Uru making units. The establishment of the National Institute for Research and Development in Defence Shipbuilding (NIRDESH), Government of India, is about 3 KMs away. The Straw Baling Unit was established in 2009 with the objective of making available good quality straw in baled form at reasonable cost to dairy farmers in straw deficit areas. 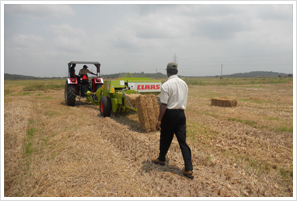 Paddy farmers supply straw to the straw baling unit where it is compressed and converted into bales for easy handling and cost effective transportation. These bales are then transported to straw deficit areas for distribution to dairy farmers for feeding cattle. In areas where machines are used for harvesting paddy, the paddy farmers discard the straw on the field itself after harvesting the paddy grains. The Union has introduced Mobile straw baling units in such areas to collect and bale such discarded straw, which is then sold to dairy farmers in straw deficit areas.